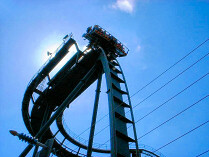 A girl in her early twenties had to be airlifted to hospital today after losing consciousness whilst riding Oblivion. The incident occurred at around 4:15pm in the X-Sector, on the vertical drop roller coaster "Oblivion". When the shuttle she was secured into returned to the station, staff members noticed that she had fallen unconscious, and had stopped breathing. They immediately performed CPR on her, and the park's medical team were on the scene within 2 minutes. On finding the girl had no pulse, they managed to successfully restart her heart using a defibrillator. The girl was then airlifted to a hospital in Stoke-on-Trent. She is reportedly in a coma. The entire area had been closed off for the duration of the incident. There is no indication at this time that there had been any malfunction of the ride to cause this incident. Update: We have heard unconfirmed reports that the girl has now made a full recovery. August weekends and the special events are the busiest times of the year.